The courses you’ll take in our Graphic Design program will give you the knowledge and skills to launch your creative career. Learn from industry-experienced instructors who will help you develop both up-to-date skills and connections to the industry. Fill out the Request Info form above to learn more about the program and our visual arts school – or apply today! In order to succeed in graphic design, you'll need to back up your raw talent and drive to succeed with a highly-focused and hands-on design education. 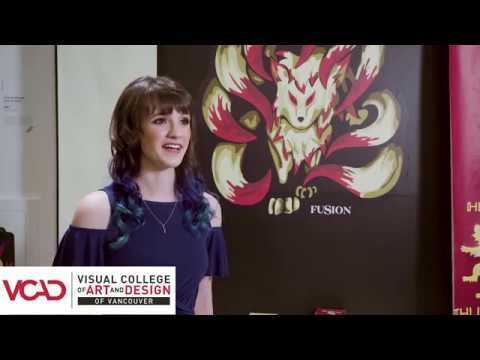 VCAD's Graphic Design program gives you the knowledge, skills, and professional connections you'll need to launch your career in graphic design. From color theory, drawing and typography, to standard software used in the industry, this program will teach you the theoretical and practical skills you need to turn your creative ideas into reality. You will build a portfolio of designs for packaging, advertising, publications, websites, and branding. Graduates of this program will be prepared to apply for graphic design jobs with web development firms, newspapers, magazines, publishers, printers, and more. The program consists of five 12-week terms. All courses are worth three credits. 75 credits are required to complete this diploma program. This course introduces the students to the popular imageediting software Adobe Photoshop. The main objective of this course is to teach the student graphical image production using Adobe Photoshop. Through this ‘hands-on’ course, the student will learn the fundamentals of design, as well as advanced features and tips, to prepare images for the Web and for print. By the end of this course, the student will be able to create and enhance sophisticated images using Adobe Photoshop’s tools and features. They will learn how to correct and modify print as well as Web images using various techniques and organizational tools. They will also learn how to apply special effects to original and composite images. Topical coverage includes: software interface, tools, functions and palettes; layers and drawing tools; fonts; and perspective. This course is an introductory level course that prepares the student to draw anatomically correct structures of the human body. Students will learn to draw the human figure in correct anatomic detail based on the observation of live models. This course will emphasize the anatomically correct proportions of the human body and the accurate portrayal of muscles and other landmarks by applying various techniques of shading and lighting, views and perspective. Topical coverage includes; basic shapes comprising the figure; anatomic positioning and parts; human proportions; drawing from live model; drawing of various anatomic parts; and light source and shading. In this course students will explore and discover a comprehensive curriculum of world art history in the context of current graphic design theory and practice. Artistic styles will be explored in terms of elements of design as they developed during each 'age' both within and across cultures. Where appropriate, anthropological themes will be woven into the curriculum so as to place significant artworks, and their influences, into context. In this course students will learn to work with the advanced functions of digital imaging software to produce graphics and textures that can then be used in a variety of design processes and output formats. Students will learn to work with layers, slices rollovers and other advanced features to produce quality images for print production or web display. Topical coverage includes: file compression, proper PPI, dimensions; slices, and rollover effects using Photoshop layers; image maps; image layers; blend modes; and painting and compositing. This course focuses on the basic principles of typography and its place and importance in graphic design. Students will learn how typography evolved from its earliest days in the form of basic symbols and forms to the present day sophisticated fonts and letterforms. Students will learn the fundamentals of working with type. Students will discover the building blocks of type, the typographic measurement units and typefaces both classical and modern fonts. The course will integrate working with type in both a manual and a computerized context. Topical coverage includes: history and language of typography; measurements (points, picas, leading, type sizes); evolution of typography; classical typefaces; typesetting concerns; and grid systems and methods of layout technique. This course introduces the processes involved in developing a solution to design challenges. The emphasis is placed on the various techniques and tools that are used in the design process. Students will learn to integrate problem solving, and critical thinking techniques as well as to call upon their creativity to develop original solutions to design challenges. Students will study various case studies, each one highlighting a unique design challenge and the processes that were used to arrive at a solution. Topical coverage includes: concept and its role within design; concept formulation processes; corporate identity systems; systematic design processes; and concept development. This course will explore the processes of page design and layout. Using industry standard composition software, students will learn to apply design concepts to the development of creative page layout designs. Students will learn to import and prepare various components and incorporate them into the final page layout. Students will gain working knowledge of the tools and features of composition and layout software packages. Topical coverage includes: visual language of design and layout; layout software tools and characteristics; cross platform tools; file preparation; importing files; and layout design. This course introduces students to the fundamentals of digital photography. Students will learn how to set up the camera and learn common program modes. Students will learn how to manage parameters such as composition, lighting and exposure. The course will cover different lenses and focal lengths. The course will discuss the download and transfer of photos and organizing photos. Students will learn how to fine-tune and edit photos with Photoshop Elements. Topical coverage includes: camera setup, scanning, file formats, sizing, image capture and storage; depth of field and motion; adjustments, color, contrast, selections, filters; camera controls; lighting; still life, outdoors and indoors photography; compositional techniques; and mounting and presentation techniques. Designing print publications is one of the most important components of a graphic designer’s work. This course will lay the foundation for the work involved in creating a publication of various formats. Although the arrival of desktop publishing has greatly facilitated the publication process, the designer must still overcome some of the common obstacles and challenges encountered in printing and publishing. The course focuses on the design of single and multi-page publications that combine type, graphics, colors and textures while addressing some of the common printing and publication challenges. Topical coverage includes: design concepts for various outputs; one page and multi-page documents; master layout pages; color palette and libraries; style sheets; and tables and charts. This course explores the importance of digital page composition in modern print production. The course will cover advanced topics in print production and its relevance to electronic pre-press, digital and variable data printing, color management and color scales, dynamic publishing as well as direct to plate and convention separations. Students will also learn about post press and finishing processes. Students will learn to create multiple page digital pre-press documents. Topical coverage includes: print production and its relevance to electronic prepress; digital and variable data printing; color management and color scale; dynamic publishing; direct-to-plate and convention separations; and post press and finishing processes. This course introduces the fundamental features of package design including the typical package materials, the processes and decisions that go into the design, and production of a package. Students will explore the various materials and types of packages that are in use today as well as current trends and concerns surrounding packaging. Students will learn to combine the creative design concepts and the choice of materials to develop creative packaging solutions. The course will explore some of the most notable packaging successes. Topical coverage includes: history of packaging; typical packaging materials; current trends in packaging; environmental and cultural issues; and surface graphics. This course explores the role of the graphic designer in the process of developing branding or corporate identity systems. The course will explore the components that typically comprise a corporate identity system. Students will learn the processes and considerations that impact the design of corporate logos, colour selection, type, symbols, branding elements, stationary and other collateral elements. Students will explore several case studies of prominent companies and brands and how graphic design influenced their corporate identity systems. Topical coverage includes: corporate identity systems; brands and branding; design strategies; collateral applications; and symbols, logos, type and colour selection. This course will explore the role of graphic design in the context of advertising. Students will learn about current trends in promotion and marketing, establishing a target market, consumerism, visual stimuli, advertising theories and strategies, product placement and how they impact the design process. Students will learn the importance of meeting deadlines, professional presentation and attention to detail. The course will explore some of the issues and challenges that must be considered when design advertising collateral. Topical coverage includes: branding and corporate identities; overview of the role of marketing; current trends in promotion and advertising; consumerism; target market; visual stimuli; and advertising strategies. This course explores the production of interactive multimedia projects. Students will learn how to design an animated prototype using interactive multimedia software. Most computer programs combine a certain degree of animation with static graphics and images. Interactivity between the user and the program is a mainstay. This interactivity combines animation, audio, video and the ability for the user to respond to the program using a variety of input methods. This type of program is used in the game industry, education, simulators; computer-based training and other applications. Students will learn how to import images and other vector based artwork, create animated buttons and graphics, control and manage movie clips and import audio files. Emphasis will be placed on design and optimization of files for deployment on the Web. Topical coverage includes: flash interface; symbols, instances and the library of assets; importing images and other vector artwork; motion and shape tweening; shape hints; working with layers; creating animated buttons; controlling and modifying movies and movie clips; importing audio; and bandwidth profiler and publishing for the web. This course introduces the fundamentals of website development. The students will learn about the structure and components of an HTML / XHTML based website. Students will learn how to design and create a fully functional website using the tags and features of the markup languages. Students will learn to work with text, tables, images forms and hyperlinks to populate their website. Topical coverage includes: terminology; authoring software; HTML / XHTML tags; tables, lists and forms; navigation concepts; using content from other sources; and uploading a web site. This course is aimed at preparing the students' transition to the professional world, allowing them to place the final polishing touches on their portfolio work. Students will be required to explain and defend the presentation structure of their portfolio and individual pieces to a panel of their peers and industry in the format of a job interview. All portfolio components should demonstrate the student’s mastery of the programs core competencies while highlighting the uniqueness of their work. Selected pieces should reflect a standard of quality evidenced by additional time spent polishing applied skills. Students will be required to complete their presentation website and marketing collateral. This course explores the relationship between marketing and the design of advertising collateral. In order to appreciate how to design the advertising materials, it is essential to appreciate the link to marketing. This course will explore how price, promotion, distribution, target markets and the product itself relate to advertising and thus the design component of advertising. Lectures include a review of the target market sectors and how to produce designs that are relevant to a particular target market. Students will also learn how budgets, corporate marketing strategy and the company vision will influence the design of marketing and advertising collateral. Topical coverage includes: marketing to current lifestyles; popular trends in marketing; target market; consumer trends and buying behaviour; forecasting trends and lifestyle changes; packaging and promotion; international and global consumerism; marketing channels; and technology and marketing. In this course students will build upon the skills learned in Dynamic Media I and create engaging interactive content with ActionScript 3.0 for Flash CS4. Students will learn the fundamentals of adding interactivity to Flash files using ActionScript via the Actions panel, as well as in external ActionScript files. The course covers the creation of simple navigation and timeline control and progresses through controlling animation with ActionScript code; using Event Listeners and writing event-handling functions; and controlling loading of and interaction with data, text, video, sound, and images. Topical coverage includes: animation for multimedia; controlling multiple timelines; loading and unloading movies; ActionScript coding; creation of control buttons and movie clip events; functions and arrays; dynamic data; working with external scripts; and working with objects. The main objective of this course is for students to experience the authoring of a dynamic website using a popular, dedicated web-authoring tool and server technology. The student will build upon the web design skills and competencies gained in previous courses through more advanced practical exercises and assignments. The student will be asked to integrate all design, technology, graphic design and presentation skills into producing a final interactive website. Students will be asked to work with the full line of software packages and technologies including DreamWeaver, Flash, Photoshop, and Illustrator. Topical coverage includes: advanced layout concepts; dynamic and interactive web sites; behaviours and commands; advanced graphics; FTP uploading; and sitemaps. See how VCAD graduates use their skills to create impressive portfolio projects.